Well..I'm committed now...I can't stop playing along with the Waltzingmouse team and their fun sketches!! This week's was a doozey, a real challenge, which I love! For this challenge, I took a little freedom from the literal sketch, using a full solid circle vs. a large circle created from many little circles (good grief does that make sense??) LOL! You might want to hop on over to the Waltzingmouse Sketch blog so you can check out the sketch for yourself! :-) I knew as soon as I saw the little wreath that Claire created for the sketch that I wanted to do something similar and then...I read a wonderful paper flower tutorial on Lisa Johnson's blog...The wheels started turning! For my wreath I first used my plain circle Nestibilities to cut out a wreath shape, which acted as a base for my flowers. I then used a SU! punch to punch out a boatload of flowers. Since my flower petals were much smaller than the one's used on Lisa's tutorial, I think my flowers ended up looking a bit like a hydrangea flower....fabulous! The flowers were attached to the frame with Glossy Accents. I then added the Home Sweet Home banner, from the Sewing Box Hugs set, and finished off my wreath with the tiny heart from the same set. I also turned the flower middle into a button by poking two holes in it and pulling my twine through so I could create a bow. Oh, the designer paper is from Basic Grey. Enjoy and visit the sketch blog to see the challenge details and all of the design team's beautiful work!! Happy Monday! How was everyone's weekend? I had a class on Saturday and then worked for the remainder of the day so my weekend went by in a flash. It's scary that I'm looking forward to a new week so I can get some things done around the house. ;-) Today I'm excited to share a new Sweet 'n Sassy Cocoa image. How cute is that little Cocoa mouse, love him! This image is part of a newly released acrylic stamp set, Feeling Fruity. This darling set includes not one but two Cocoa images along with a boatload of sweet and fruity sentiments. (And how much fun is it that Korin is releasing new sets every WEEK!) Be sure to check on the store's site frequently for the lastest news and releases. I decided to go with the Happy Summer sentiment as it appears that summer has finally and fully arrived in New England. We've been enjoying hot days, cool nights, and a few showers thrown in...it's been delightful. Along with enjoying the weather, we've been letting the boys stay up late, eating far too much ice cream, and spending our morning, afternoons, and evenings outside. Last night we ate pizza on the deck and then chowed down on some chocolate ice cream...ahhh...it's so nice...it makes me happy. Since Cocoa looks so summery peeking out from behind the watermelon slice, I decided to grab some brand new super bright and cheery Bo Bunny paper that I picked up while working on Sat. (I wonder if I'm actually making money anymore or just spending it on new products?? Don't answer that....) I love the bright colors! 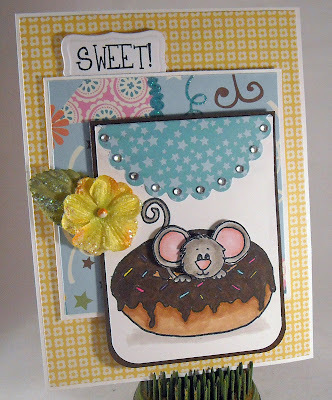 The layout is from this week's Sweet Stop challenge and did you notice those tiny pink dots on the mouse image? They're part of a mistake I made that I decided to turn into a design element! When I was coloring my mouse, with Copics, I must have flicked the tip in the cap of one of the markers and splattered a few dots of pink right on my square. Arrrgghhhh....Then I had a light bulb moment! I'll just add more splatters so it looks intentional! Happy accidents are wonderful! Enjoy today!! Welcome to another Keep it Simple post! 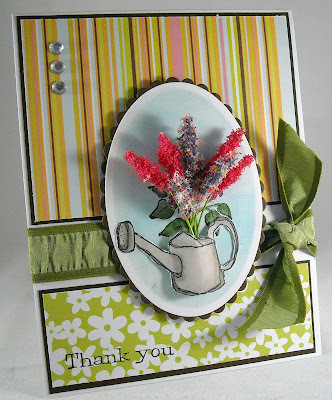 Today I'm sharing a card I created a few weeks ago for a sketch challenge contest....Didn't win but I did get a fun CAS (clean and simple) card out of it! And that's more fun than winning! Yeah! This card was super easy to create!! 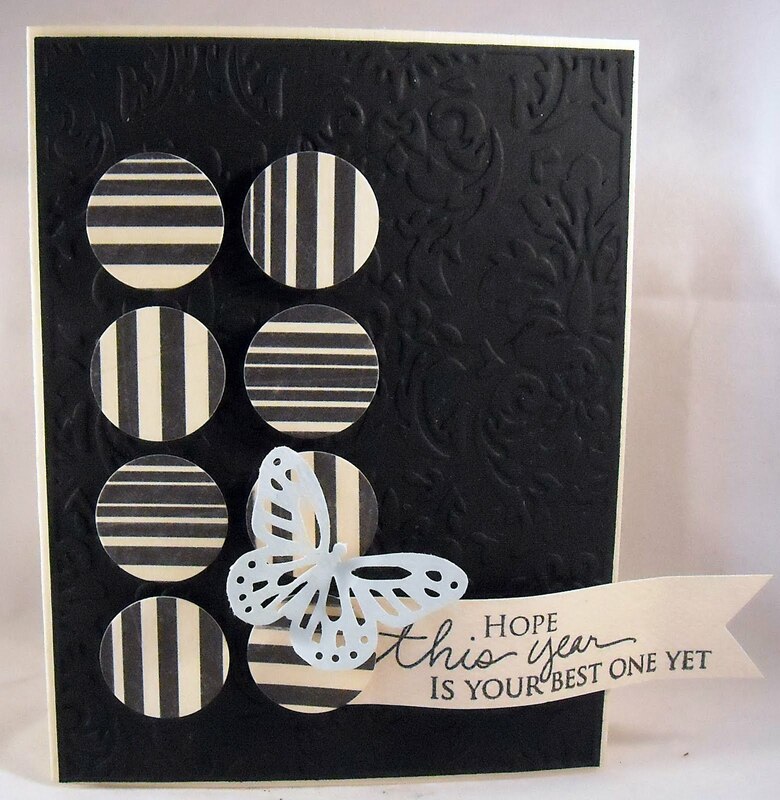 I embossed the black background piece of card stock, using an embossing folder. I then punched the circles from a black and cream piece of striped paper from Crate. For a little visual interest, I attached the circles, alternating which way the stripes were facing. I also used a little foam tape to pop them up. The paper ribbon is showcasing a sweet sentiment from Papertryink and my butterfly is from a Maaaartha punch. Enjoy!! In my beautiful, my beautiful balloon...Anyone remember that song or am I really dating myself? Happy Friday everyone, are you all ready for the weekend? I'm looking forward to a few quiet days but before I depart from blog land, I wanted to share this darling Hot Air Balloon digi image that Sweet 'n Sassy released a few weeks ago. I've been itching to color it and make it into a card! I thought that this week's Digi Day Challenge of using pink and orange would be perfect hot air balloon colors! I also added a few white gel polka dots to the top of the balloon...Now all I need are some fluffy white felt clouds I keep seeing on other's cards... ;-) I'm not sure where the designer paper is from, it's some that I had in my stash, but the rhinestones are from Kaiser, image was colored with Copics, and the layout is from Mojo Monday. Enjoy! Welcome to another SALT challenge! This week I was blessed to have the opportunity to present a topic to our wonderful DT and I chose a verse from I Samual 15:22, "to obey is better than sacrifice." How can we apply this verse to our modern lives and experiences? We can think of those we know that are very giving, maybe even putting professing Christians to shame. They feed the poor, give a lot of money to charities, sacrifice their time to certain causes, etc. However, these same folks will never bow the knee to Christ. In Matthew 7:22 Jesus tells His followers, “many will say in that day “Lord, Lord did we not prophesy in Your name, cast out demons in Your name, and done many wonders in Your name? And then I will declare to them, I never knew you…” That said, I agree that works are important, God calls us to good works (James 2:14) but to offer works without faith in Christ is empty. I spent many years proudly boasting of the many things I didn't do. I had a neat little list; I didn’t drink, didn’t smoke, didn’t listen to “worldly” music. The problem? I don't believe that I was trusting in Christ; I was merely worshipping myself and my list of man made rules. Had God not truly changed my heart, I would have been one of the ones He confessed to not know. My study Bible has this to say on faith and works, "...(there are those) that know the gospel and even agree with it, but fall short of trust in God. Failure to grow, develop, and bear the fruits of righteousness shows that the free gift of Christ has never been received. The answer for those with such a faith is not to save themselves by establishing a righteousness of their own, as if they could create faith by their own efforts, but to call on the name of the Lord (Rom. 10:13)." I pray that our topic is a blessing and encouragement to you! Feeling inspired to create based on this week's theme? Please visit the SALT blog to see all of the DT's work and leave us a comment with a link back to your blog or online gallery. ATC Details: This was a 30-second creation! 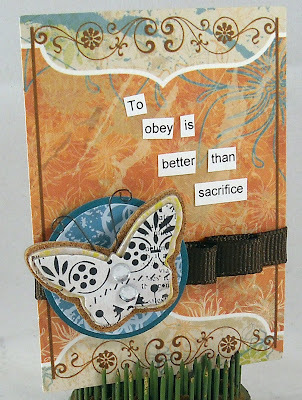 I used a pre-printed ATC card from Ruby Rock-it and then added a piece of ribbon, circle of coordinating cardstock, verse, and a pre-formed chipboard butterfly (I added a few rhinestones), also from Ruby Rock-it. Enjoy! I can't stop myself...I had to play along with the Waltzingmouse sketch challenge again this week! I love the Sewing Box Hugs set!! Let's see...I've used the bird image, the flower image, and now I'm onto the heart image...I've got weeks of challenges left before I've gone through the entire set - yeah!! Humm....maybe I could order more sets...oh, now that sounds like a very fun idea!! Claire, Get ready for my order!! :-) In addition to the sweet heart image and sentiment from the Waltzingmouse set, my card features some fabulous paper from Creative Imaginations. This paper has one side that is actually geared towards babies but the other side...oh, my...it's so bohemian! Love it! 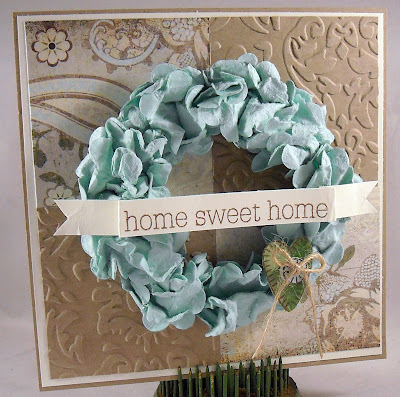 Ribbon, little button, and twine is from Papertreyink. Enjoy and head on over to the WSMC sketch challenge to participate, you have until tomorrow!! Guess what? 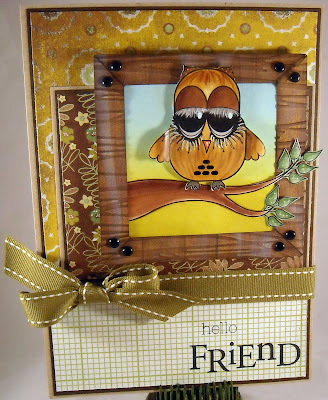 Sweet 'n Sassy is going to be releasing stamps on a weekly basis! Wow! Isn't that amazing! We'll have fun, new sets to share on a regular basis...I can't wait! 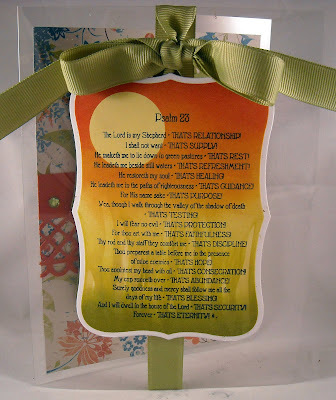 Today, I'm sharing the Psalm 23 stamp set, which is actually just one big 'ol stamp with a lovely version of Psalm 23 that includes statements about what each verse means. This would be a great stamp for scrapbookers as well since the image is the perfect size for a page. I decided to create a background for the stamp, using Distress Inks and cut outs like the circle shape and a grass shape, which is just visible in the green background. Since this is a large image I decided to create a 5x7 card, a size I've been playing around with lately...love it! It's almost like creating a mini scrapbook page. It's a great size for larger images or if you really want to lay on the embellishments and layers! I opted to go with a acetate card, and forgive me for taking a photo on a white background as it's a bit difficult to see the card. It looked good on my camera last night...I kept the front of the card very simple, just the verse and a ribbon, from Papertryink. I then had a grand 'ol time decorating the inside of the card, which is partially visible on the outside....being that the card is clear and all. **wink** I used the same size die cut for the sentiment, which is also from another soon to be released set, Amazing Grace. (This set is also available as a digi set for only $4.00!) 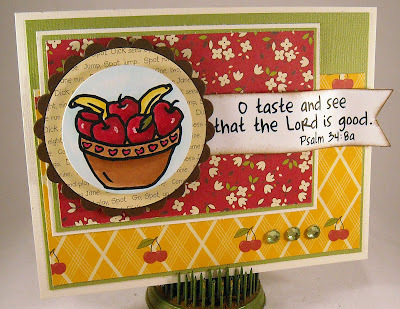 This yummy paper is from a new line from Ruby Rock-It that just arrived in the store last week....love it! I created a decorative strip using a Martha punch and then just added a few rhinestones for a tiny bit of bling. Enjoy and be sure to check out the Sweet 'n Sassy site to see all of their new releases! How about another Waltzingmouse card? This is a copy of a card I made awhile ago for another KISS post, only this time I used the heart and love sentiment from the Sewing Box Hugs set. 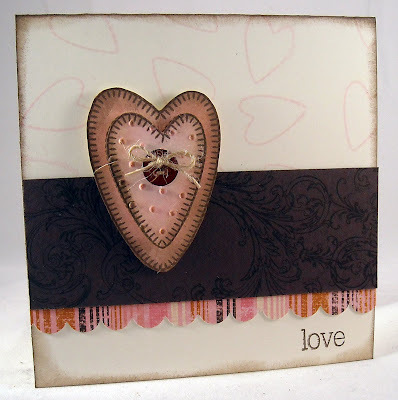 To create the heart, I stamped the image twice on cream cardstock that I colored pink with Distress Inks. I then ran the smaller heart through my Big Shot using the swiss dot embossing folder. The hearts were popped up with foam tape and a wee button was added to the middle. Just needed a few scraps of paper to run underneath the heart and dress things up a bit. I stamped a swirl image from a Tim Holtz set on the brown cardstock and the pink stripe was just an extra strip for some designer paper. Easy peasy! Enjoy!! Hey there!! Only one more day until Friday, whose ready for the weekend? I am!! It's been a busy week and I'm looking forward to a few days of rest. Whose with me?? :-) Well before we get to the weekend, we get to enjoy another Sweet 'n Sassy digi day over at SNR and PCP. Today's challenge is to create a masculine card and with Father's Day just around the corner, it's the perfect time to pull out those manly cards. I created a card for my Dad (gee, hope he's not ready the blog today...close your eyes Dad!) 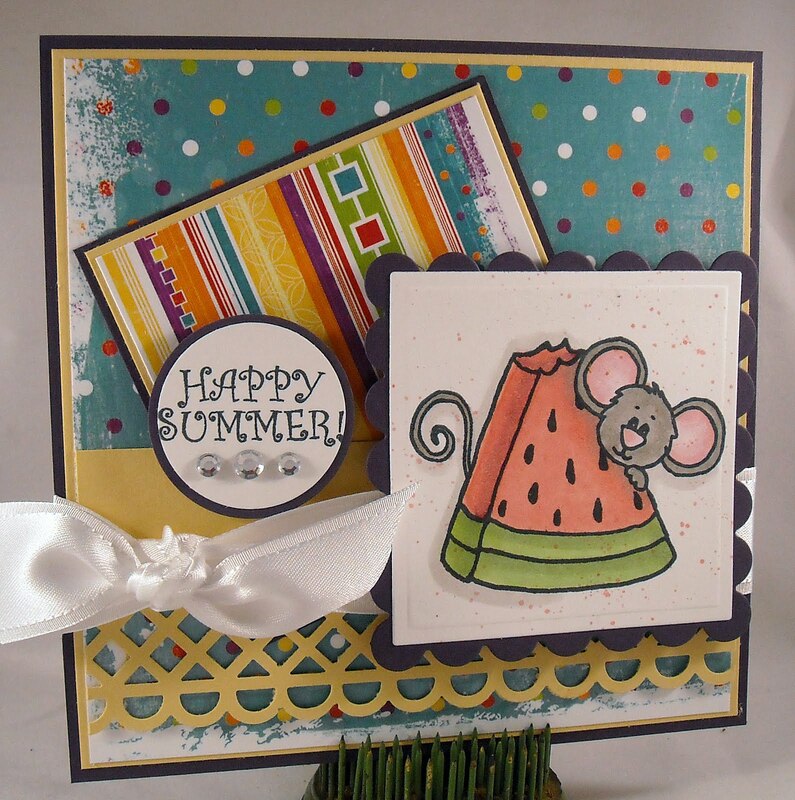 using a retired acrylic stamp set from SNSS. 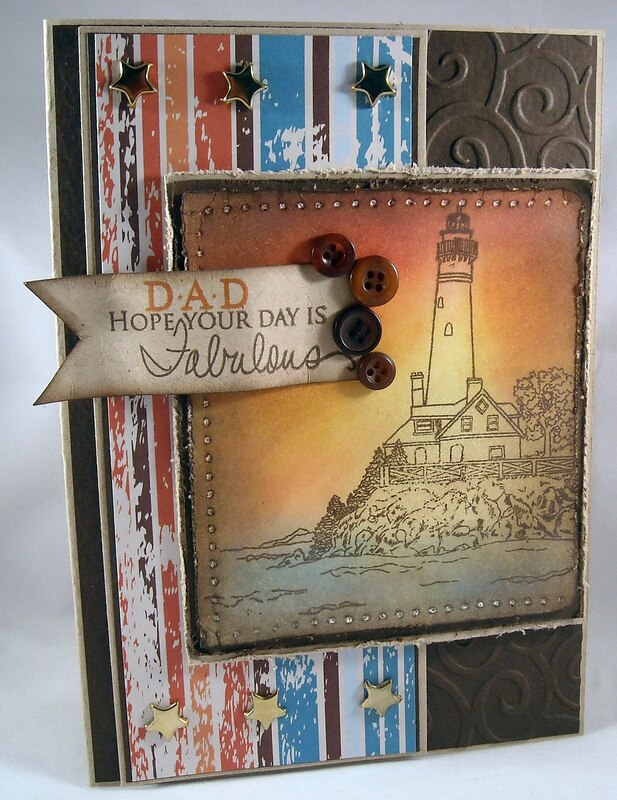 I love lighthouse images and think they're a perfect choice for masculine cards. Instead of coloring in the entire image I decided to create a color background, using Distress Inks. I used a blending tool to add the ink after stamping the image. The edges of the cardstock have been pierced and distressed. (Whole lotta distressing going on!) The striped paper is a new line from Ruby Rock-it that I picked up at Wholly Scrap. The sentiment is from Papertreyink, as are the buttons. 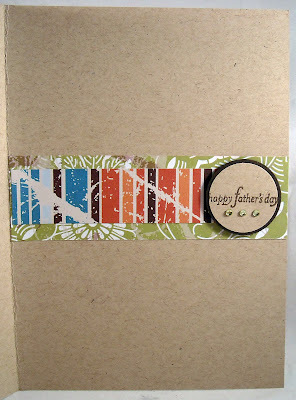 And I included a Happy Father's Day sentiment inside my card along with a few paper scraps! Be sure to check out the SNR and PCP pages for the full challenge details and to be entered into the drawing for free digis! Enjoy! Hey, guess what? Remember that Waltzingmouse sketch challenge I took part in last week? Well...I won one of the Top Mouse awards! What!!! I was shocked and thrilled! What a HUGE honor for my card to be selected. A great big THANKS to everyone at Waltzingmouse!! So, of course, I had to play along this week as well! Just so I could showcase these great stamps again!! And since I have only one set, this is an image from the same set, Sewing Box Hugs, that I used last week. This time I used the flower image and 'sew' sweet sentiment, which has been paired with some new paper I just picked last week from work, just released from Ruby Rock-it. This paper rocks!! I wanted to keep the entire piece black and cream with the only color coming from the oval background. I cut out each piece of the flower from cream and kraft cardstock and layered it, along with folding up the edges of the petals, for some nice dimension. A few black rhinestones added the finishing touch! Enjoy and please check out the great sketch and artwork on the Waltzingmouse Stamps sketch blog! 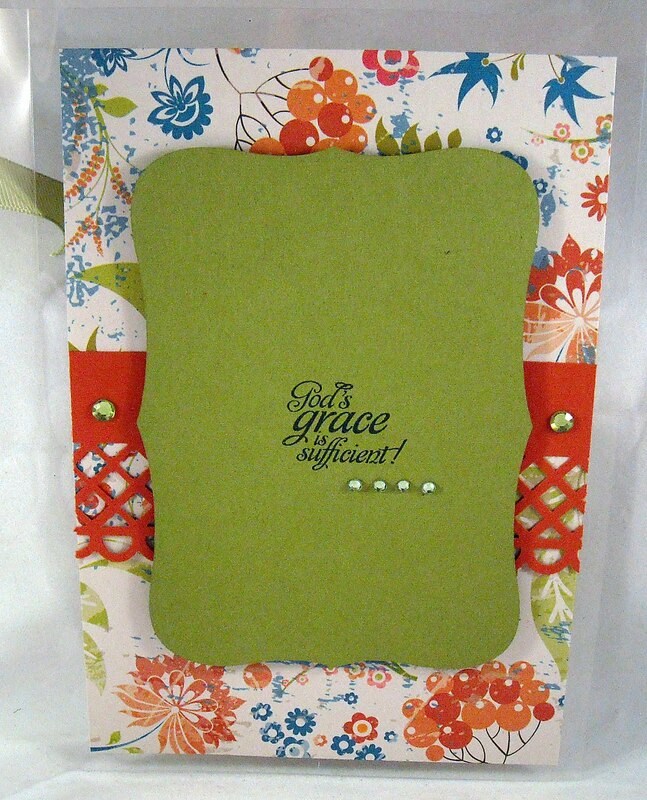 I created one of these fun manila file folder albums for a Wholly Scrap class coming up at the end of the month. 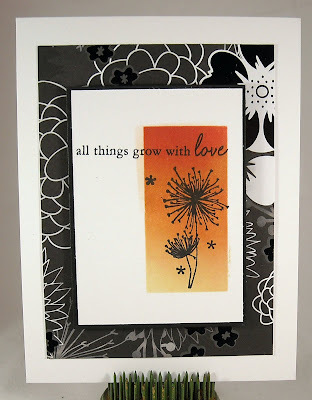 Cindy Lawrence demonstrated one of these at our last Stamping Around event and it was a huge hit! Cindy's was an organizer, which included a few pads of paper, mine is more like a scrapbook where you'd put photos in the pockets and journaling below. Now to find some nice beach photos... Here's the inside of the album....There are four pockets for photos. 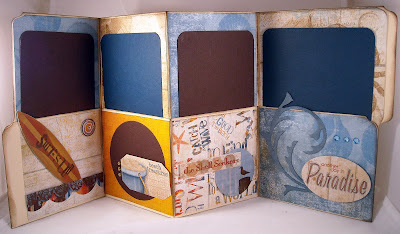 You can even decorate the back of the folder for more photos or journaling. This is a fabulous paper line from Bo Bunny featuring all kind of beach-themed images and designs. The line also includes a 12x12 page of stickers, which I used on the inside of the album, and a page of cards that can be cut out and used as journaling blocks. 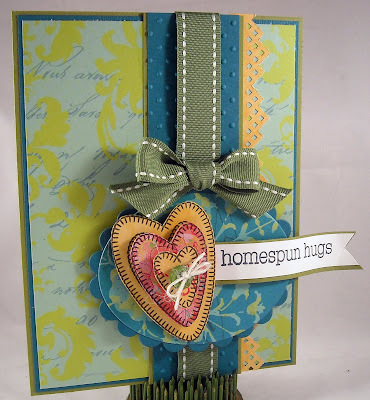 I used one of the cards to decorate the front of the album along with a piece of twill ribbon. It's going to be a busy week this week so I'll pop back in as often as I can.... Enjoy! How about a reverse masking technique for today's KISS project? 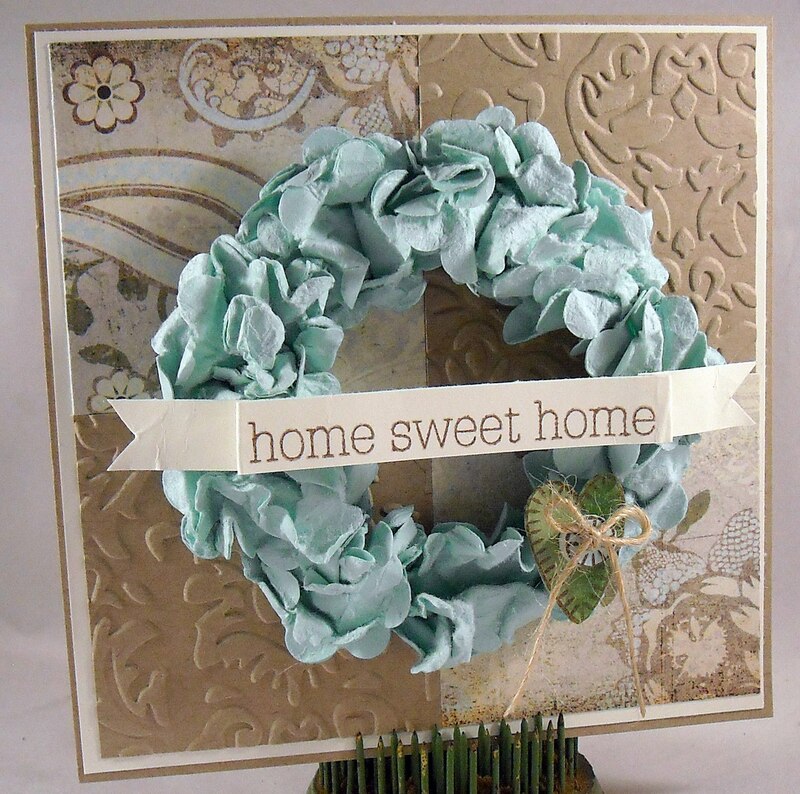 It's a great way to create a quick and easy card! I used a Nestibilities die to cut out a rectangle shape from a piece of scrap paper. I then used the left over part as a stencil, which was placed another piece of pre-cut cardstock. A blending tool and Distress Inks added the color inside the stencil. All that was left to do was add this cute flower and sentiment in black ink. The flower stamp and designer paper from from Imaginisce and the sentiment is from Papertreyink. No bows or other embellies...now that is how to keep it simple! Enjoy!! Raise your hand if you remember when Flower Soft first hit the market? Seems like it was all the rage for awhile and then things started to quiet down...or is it just that I'm not that up on what's going on in the world of Flower Soft? (That's probably a more likely answer!) Well tonight I'm teaching a class at Wholly Scrap and we're going to dive into a few tubs of Flower Soft (not literally, of course!) to create this card. I found a tutorial on making these cute bouquets on Splitcoast and I even happen to have the OCL stamp set that was used in the tutorial so...I created a similar look and I love it! 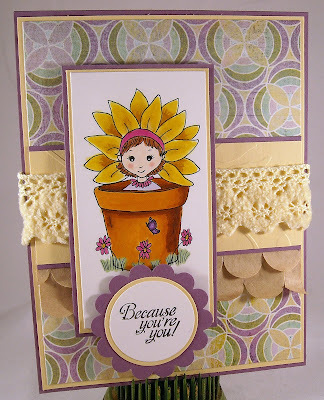 It's so much fun to see the pop of color and dimension that Flower Soft gives to a card. Another fun thing that I found out, quite as an accident since I realized when I started to make my flowers that I didn't have any white glue in the house, Glossy Accents works awesome when making the bouquets. It dries much faster than white glue and once it's dry, there isn't a single piece of Flower Soft that's coming off the wires! I'm looking forward to demonstrating this fun technique tonight... Other elements for this card...This fabulous ribbon is from American Crafts and the paper is from Jillibean Soup. Enjoy your weekend and be sure to check back on Sunday for a Keep it Simple card! It's time for another SALT challenge! And this week our theme of a Mother's love is brought to us by Julie. She has a lovely write up over on the SALT blog, please check it out when you have a minute. 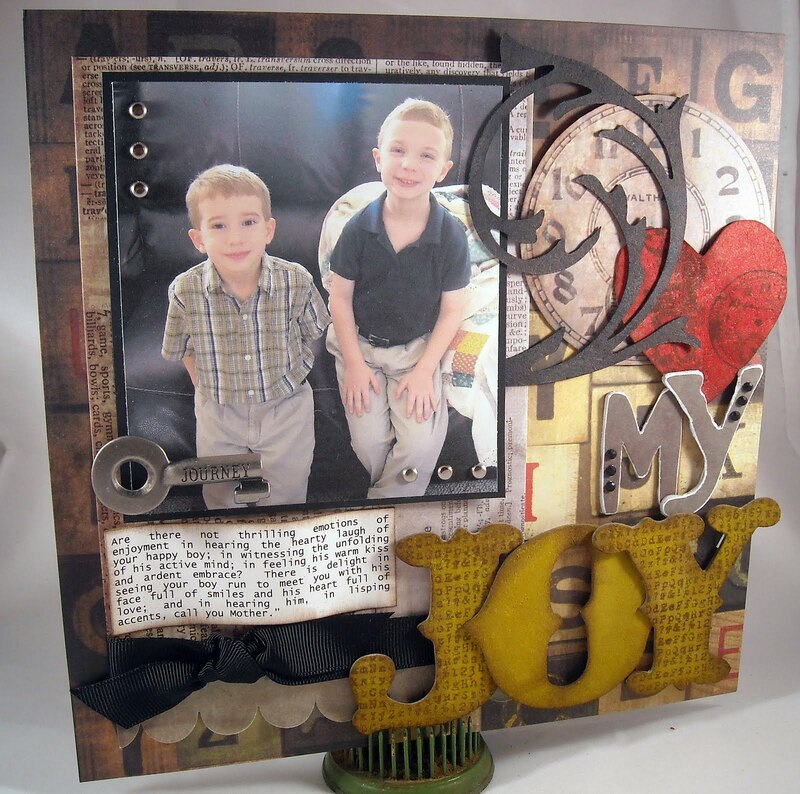 For this challenge, I decided to focus on the joy of Motherhood and created an 8x8 scrapbook page of my two handsome boys, who are the joy of my life. The journaling, which is taken from a most excellent book titled, "The Mother at Home" by John S.C. Abbott, is noted on my layout and it reads, "Are there no thrilling emotions of enjoyment in hearing the hearty laugh of your happy boy; in witnessing the unfoldings of his active mind; in feeling his warm kiss and ardent embrace? (There is) delight in seeing your boy run to meet you, with his face full of smiles and his heart full of love; and in hearing him, in lisping accents, call you Mother." Ah, there's nothing like the writings of faithful men and women from the 18th century - so much depth! Just reading that sentence makes any frustration of any day melt away, renews my strength, and has me delight that God has blessed me with the privilege of being a Mom to these two little boys. Well friends...I just spent an hour writing the rest of my post and when I hit the publish button...it disappeared. Talk about frustrating...Since I don't have time to do a complete rewrite, I'll simply share a snippet of what I had written, starting with a quote from another excellent book, "Shepherding a Child's Heart" by Ted Tripp on the role of parenting. "This shepherding process is a richer interaction than telling your children what to do and think. It involves investing your life in your child in open and honest communication that unfolds the meaning and purpose of life. It is not simply direction, but direction in which there is self-disclosure and sharing. Parenting is shepherding the hearts of your children in the ways of God's wisdom." We have an awesome responsibility as parents! We are given our sweet little ones for such a short time, to love and care for obviously, but to also teach them about the deeper issues of live. While I can't force anyone to be transformed, not even my children for they will ultimately grow up and make their own decisions, it is my job to point them in the right direction. Proverbs 22:6, "train up a child in the way he should go; and when he is old, he will not depart from it." My greatest desire is not to see my children grow up to have all that they ever wanted or to necessarily be wildly successful by the world's standards but to see them become courageous, strong Christian men. May God be pleased to answer those prayers... Please stop by the SALT blog to see the beautiful creations posted by our design team! As for my project - All products by Tim Holtz...children by Kevin and Kim. ;-) Enjoy! 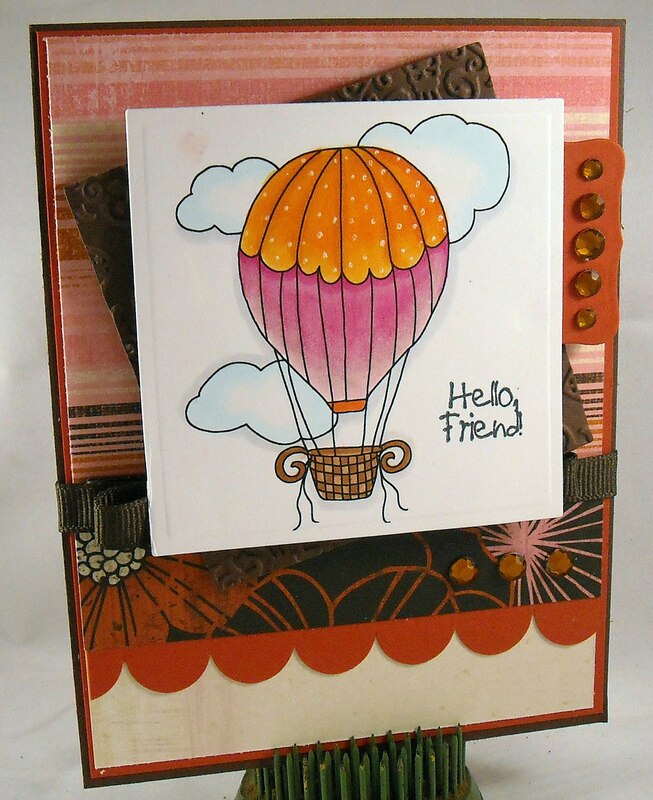 I recently started following the blog of Claire Brennen, owner of Waltzingmouse Stamps. 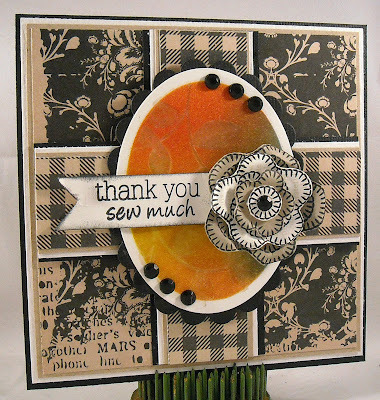 I've know of Waltzingmouse Stamps pretty much since the beginning, thanks to my buddy Julie who is always in the know! However, I had never used a set until the Stamping Around NH event earlier this year. The result? I love them!! We used the Sewing Box Hugs set at the SA event and I was fortunate enough to have received one of the sets that Claire generously donated for the class. Thank you Claire!! I used the bird and sentiment from that set for today's card... Turns out that this week Claire launched a sketch challenge blog...And what do we know about me and sketches? Right...I love them! Since I managed to get a lot of this week's design stamping work done early, I had time to play a bit last night and this is the card I came up with for the first challenge. The designer paper used on the card is from Jillibean Soup and it's a farm-themed paper, perfect for my farm fresh birdie (who I'd like to say is really a chicken). Did I tell you about our chickens? Ah, that's for another post. :-) I embossed the frame with the Swiss Dot embossing folder and used the tolle technique for my bird, ahem, chicken. A little rhinestone eye and lovely green button from Papertreyink were the finishing pieces. 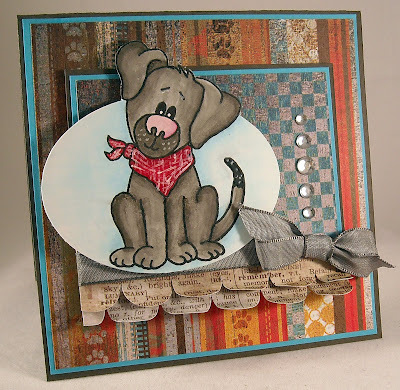 Head on over to the new challenge blog and check it out...You can use any stamps and sometimes there are prizes... Enjoy! Did you know that each Saturday Korin posts a sketch challenge at The Sweet Shop? If not, you should check it out and play along with the challenge! Well I don't think it's any secret that I love sketches! I find that a card comes together so quickly when I have a sketch to follow. (I also keep a folder full of already colored images on hand so I the creation process can really fly! 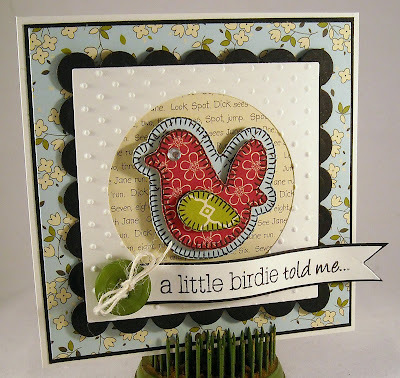 It's perfect for creating a card when you're short on time...which is what I am just about every day!) This week I decided to ink up one of the newly released Sweet 'n Sassy stamp sets, Woof You. I'm typically not a huge animal stamp fan but this little face is so cute I couldn't resist and I decided to color him in a dark grey shade so he resembles our dog Max, who passed away about a year ago. (I still miss his little face!) And guess what the name of the fabulous designer paper is? Max and Whiskers! It's a new pet-themed line from Basic Grey, that I picked up at Wholly Scrap. See the tiny paw prints on the paper...so cute! The bottom scallops are a newsprint (need that for a new puppy!) 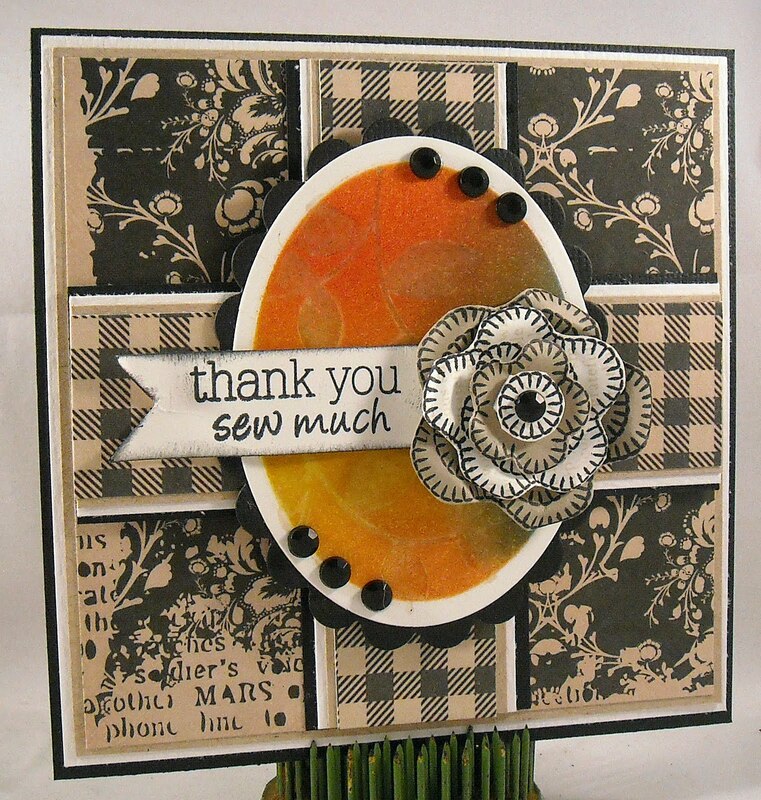 paper from Tim Holtz's new oh so grungey paper pack. Rhinestones are from Little Yellow Bicycle and the ribbon is an oldie from SU! Guess what else I did? 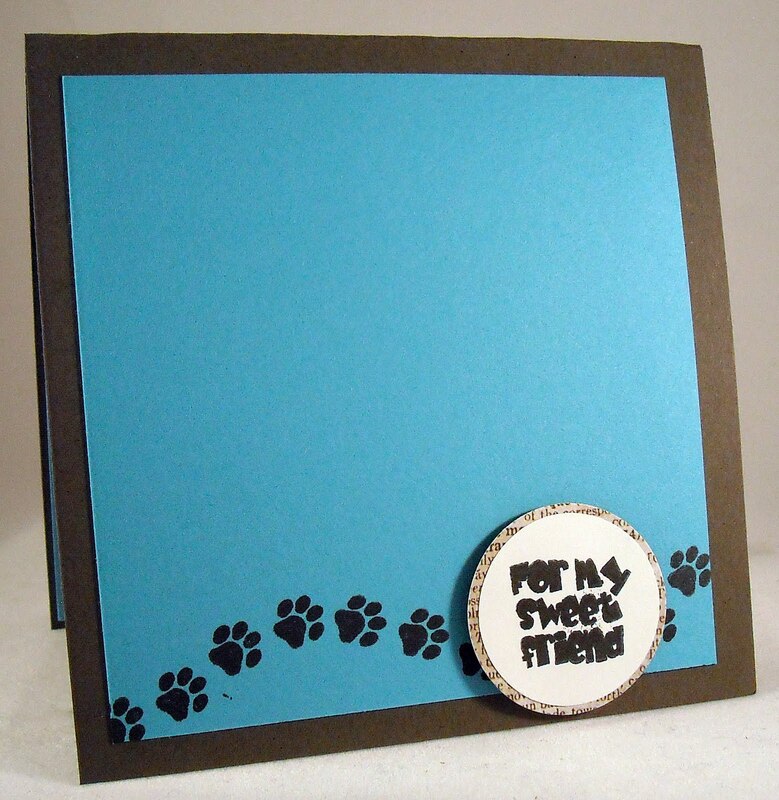 Decorated the inside of my card...I never do that but I just couldn't find a good spot for my sentiment on the outside and I was itching to use the cute paw print stamp so this was the perfect solution! Enjoy today's card and hop on over to The Sweet Shop to check out all of the challenge details! Hi all! I'm so excited to be bringing you the very first Tiffany Doodles challenge! Every month the TD design team will bring you a new challenge and every month you'll have the opportunity to win a boatload of FREE digis!! Here's how the challenges work: 1) On the 7th of every month the design team will post a new challenge on their blogs and on the Tiffany Doodles site. 2) In order to win you need to participate in the challenge. 3) You'll have until midnight on the last day of each month to enter. 4) There will be four winners for each challenge. Three winners will be selected based on their card's design style and one will be a random winner. 5) Prizes: 1st place - win 7 digis 2nd place - win 5 digis 3rd place - win 3 digis Random - win 3 digis 6) Visit the Tiffany Doodles web site for full details, to enter the challenge, and to see all of the DT's work based on the current challenge. 7) If you post to online galleries, please use keyword/tag: TD01 8) Join our groups on Flickr and Paper Craft Planet OK...on to this month's challenge!!! One of my favorites, a sketch challenge! This month's sketch was submitted by Jenyfur, owner of Caardvarks! How much fun is that! 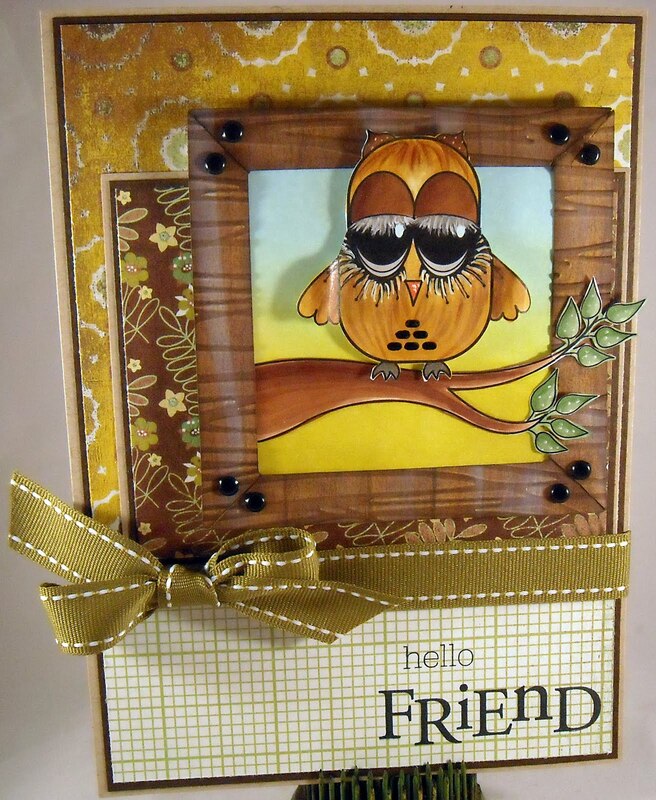 I decided to use this darling Owl image for my card and perched him (or maybe it's a her with those fabulous eyelashes) on this sweet Branch image. After coloring my images with Copics I decided to create a faux wooden frame to house my sweet owl. 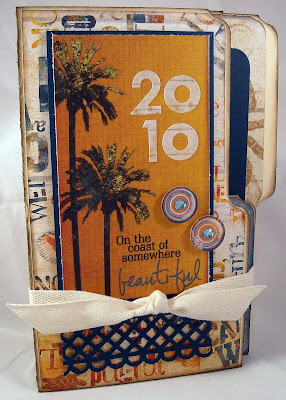 This is a great technique that I just found on Splitcoaststampers. It's a super easy way to frame an individual image. My patterned paper is a new line from Basic Grey, ribbon is from Papertreyink. Now head on over to the Tiffany Doodles site for all of the details and to check out all the other amazing work!! Looking forward to seeing what you all come up with!! Enjoy! ...that the Lord is good! Happy Friday everyone! Are you all ready for the weekend? I can't wait and if time permits maybe I'll get in some baking...I know this darling image from the Baked with Love set makes me think of apple pie and banana bread! And that's not all...there are a total of eight digi images in this set, all sure to inspire you to bake some goodies for your family or friends! Right now it's on sale for only $10.50! In addition to showing off this darling image and sentiment, which I colored with Copics, I'm also showcasing some fun Jillibean Soup papers that are all about being down on the farm. Fun stuff!! Enjoy your weekend and try to make time for eating at least one slice of apple pie! Wow!! The Sweet 'n Sassy and Tiffany Doodles blog hops were amazing!! Thank you to everyone for their sweet comments and for visiting. Fun stuff!! 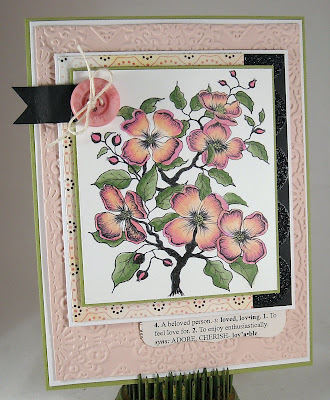 Wondering who won that beautiful Dogwood Branch image from Tiffany Doodles? I won't make you wait any longer...the winner is... vera rhuhay who said... Love them Both! 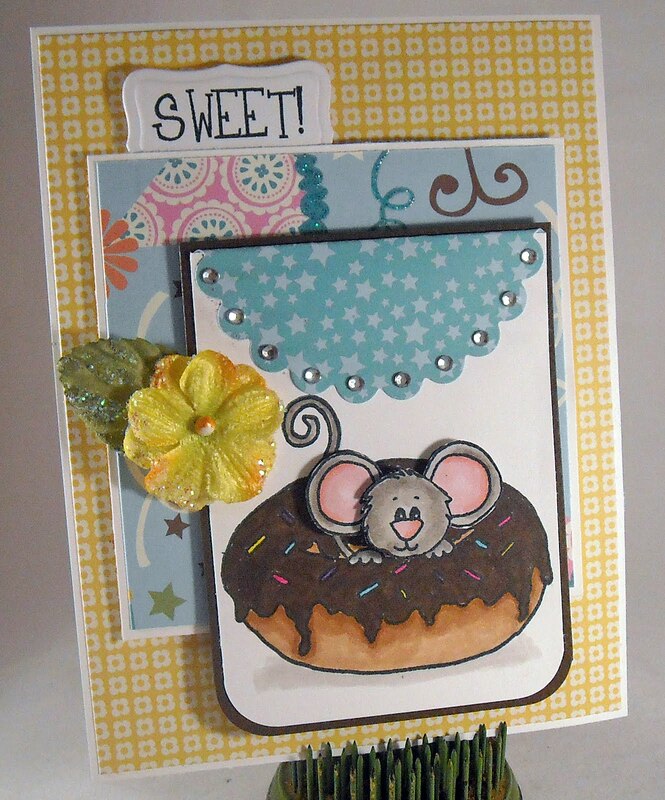 The donut with the mouse are so cute and the dogwood are so gorgeous! Vera, please contact me at ksdm@comcast.net with your email address and I'll get the image out to you asap! 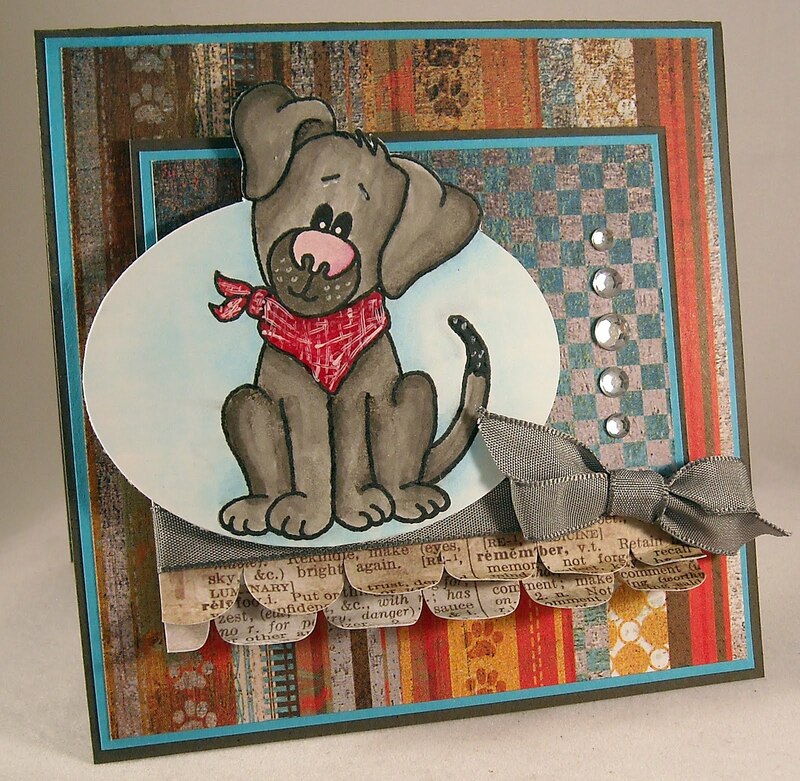 And now...news about today's Sweet 'n Sassy Digi Day over at Scrapbook News & Review and Paper Craft Planet. Visit either of those sites and participate in the challenge to receive a free digi and to be entered into a drawing for even more free product! 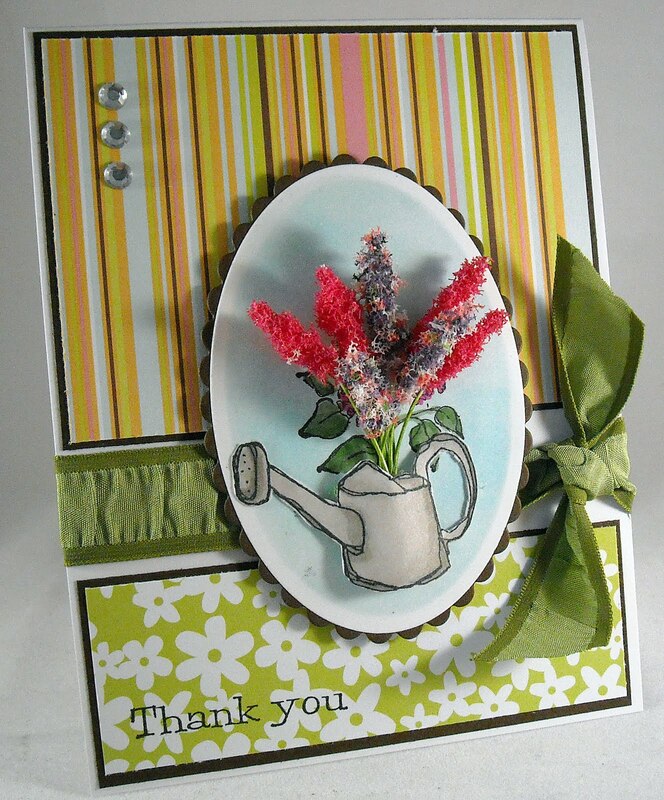 Today's challenge was to use flowers in your card. Well nothing makes me happier than floral images and patterns so my biggest challenge was picking an image from my large floral-themed collection! I decided to go with this adorable Pick-A-Boo Sophie image. Isn't she cute! I colored Sophie with Copics and used this fun Basic Grey paper line in the background. Notice the fun little scalllops? Guess what they're from...a paper bag! I was having a hard time finding just the right color for the scallops and eyed a bag full of stamping goodies on my floor...humm...the color of that bag is perfect! After I punched two rows of scallops, I curled up the edges a bit for a little dimension. And how about that fab ribbon? From a new American Crafts line...love it...It's soft and fuzzy! Be sure to head over to the SNR or PCP sites to check out the challenges! Enjoy and congratulations to Vera! Tiffany Doodles Blog Hop - Day Two!! Just a reminder that the Tiffany Doodles blog hop is still going strong! 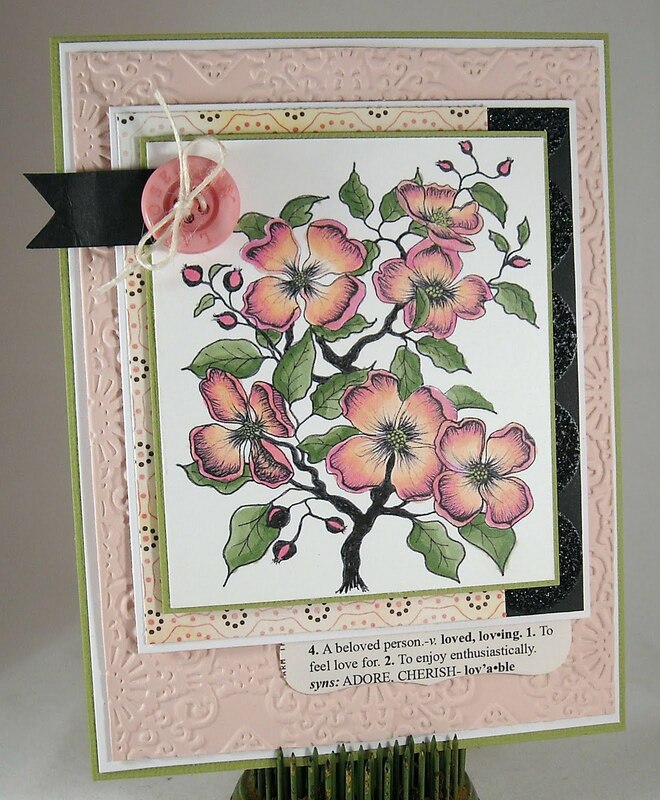 Feel free to continue commenting on today's post for a chance to win the Dogwood Branch image used on my card. Rules for the blog hop below: 1) Start at the Tiffany Doodles site, sign up to follow if you haven't already, visit every team members blog, sign up to follow and leave a comment on each blog to have a chance to win that members featured digi! (Mine is the Dogwood Branch image) 2) End at the Tiffany Doodles site and leave a final comment for the chance to win more blog candy from Tiffany herself!! The hop will last TWO days; winners will be chosen randomly on Thursday! Tiffany Doodles Blog Hop List: Official Site Tiffany Doodles Tiffany Richards Tiffany's Garden Cammy Wall Pink Room Therapy Cindy Lee My Lil Crafty Corner Deirdre Horgan Colour and Ink Donna Mikasa 3 Umbrellas Julie Masse Stampin' with Julie Kathy Racoosin The Daily Marker Kim Schofield Paperie Petals (You're here!) Lindsay Amrhein Note to Self Peet Roeven Scrap Ruby McGuire Ruby 2 Shoes Design Shannon Neparko Desert Design Studios Sunghee Chon Creativity in Progress Virginia Lu Yes, Virgina Also be sure to check back on the Tiffany Doodles site and my blog on Monday, June 7 for the first ever Tiffany Doodles Challenge!! Enjoy and THANK YOU so much for everyone's lovely comments yesterday! I had such a great time!! Please scroll through entire post!! This is covering the Sweet 'n Sassy AND Tiffany Doodles Blop Hops. There are lots of details to share regarding prizes so please read carefully!! When committing please specify if you're entering the Sweet 'n Sassy drawing or Tiffany Doodles drawing...or both is ok too!! Wow!! Hello friends, I have so much fun stuff to share with you today!! First up is the super exciting news that Sweet 'n Sassy has released a boatload of brand new acrylic stamp sets!! 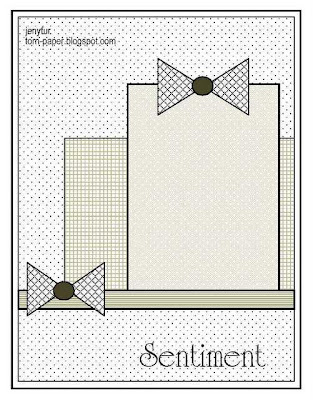 After being all digi for the past few months, Korin made the decision to release sets that include new sentiments, new groupings, and new images. I love them all!! My card features just one of the images and sentiments from the So Sweet Cocoa set, which also includes two more Cocoa-themed images and oodles of sentiments! Now let's get on to the prizes!! Sweet 'n Sassy will be giving away TWO free stamp sets!! Here's how you enter to win: (**NOTE** The SNSS blog hop begins at 6:00 am EST on 6/1/10) 1) The name of the free stamp sets are "hidden" on two of the design team member blogs so...you need to visit each of their blogs and leave a comment on everyone's blog including the SNSS digi blog. All links at the end of this section. 2) And don't forget the grand finale, a FUN-tastic release party, tonight in our SNR forum at 8pm EST TONIGHT! Find out who won our fabulous blog hop prizes, chat with the DT, play along in our games and challenges for a chance at MORE prizes, make new friends and be inspired! Plus, we have a few special surprises for ALL release party attendees, so you won't want to miss the fun! Sweet 'n Sassy Blog Hop List: Ceal Pritchett Darsie Bruno Janette Olen Korin Sutherland Leah Cornelius Lisa Jurecek Lorie Souther Nancy Brown Nicole Anderson Tricia Traxler SNSS Digi Blog Next...ohmygoodness...this is exciting news too!! I'm thrilled to have been asked to be on the newly formed Tiffany Doodles design team!! Tiffany is a designer by trade and after falling in love with the craft of stamping, started to turn her doodles into digi stamps. She has a beautiful collection and offers a variety of styles. I'm looking forward to sharing more of her images with you in the coming weeks... Today's image is simply called "Dogwood Branch", but it's anything but simple. What a great image, I fell in love with it instantly. And this image can be yours..for FREE by participating in the Tiffany Doodles Blog Hop! Here are the rules for the Tiffany Doodles Blog Hop: 1) Start at the Tiffany Doodles site, sign up to follow if you haven't already, visit every team members blog, sign up to follow and leave a comment on each blog to have a chance to win that members featured digi! (Mine is the Dogwood Branch image) 2) End at the Tiffany Doodles site and leave a final comment for the chance to win more blog candy from Tiffany herself!! The hop will last TWO days; winners will be chosen randomly on Thursday! Tiffany Doodles Blog Hop List: Official Site Tiffany Doodles Tiffany Richards Tiffany's Garden Cammy Wall Pink Room Therapy Cindy Lee My Lil Crafty Corner Deirdre Horgan Colour and Ink Donna Mikasa 3 Umbrellas Julie Masse Stampin' with Julie Kathy Racoosin The Daily Marker Kim Schofield Paperie Petals (You're here!) Lindsay Amrhein Note to Self Peet Roeven Scrap Album Ruby McGuire Ruby 2 Shoes Design Shannon Neparko Desert Design Studios Sunghee Chon Creativity in Progress Virginia Lu Yes, Virgina Also be sure to check back on the Tiffany Doodles site and my blog on Monday, June 7 for the first ever Tiffany Doodles Challenge!! Thank you so much for hanging in for this long post and for playing along with both Blog Hops! Enjoy! !